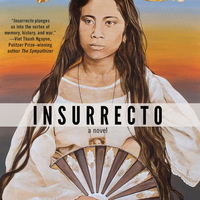 Before Gina Apostol's fourth novel, Insurrecto, hit the shelves, Publishers' Weekly named it one of the Ten Best Books of 2018. Insurrecto was also named Buzzfeed's Best Books of 2018 and Autostraddle's 50 Best Feminist Books of 2018, among many other Best Lists. Her essays and stories have appeared in The New York Times, Los Angeles Review of Books, Foreign Policy, Gettysburg Review, Massachusetts Review, and others. She lives in New York City and western Massachusetts and grew up in Tacloban, Philippines. She teaches at the Fieldston School in New York City. Decolonize Your Bookshelves is a book club founded by blogger and activist Eliza Romero, also known as Aesthetic Distance. The group will focus on Asian American writers who tell stories of struggle and triumph, and explore themes of civil unrest, assimilation, racism, and profound alienation. Because a disproportionate number East Asian writers are represented in the American mainstream compared with other Asians, the club will delve into the works of South and Southeast Asian authors , including Filipino, Indian and Vietnamese creators. The goal: thought-provoking discourse that reveal the absolute necessity of these works to the American collective identity. Gina Apostol will be in conversation with Eliza Romero. Greedy Reads will sell copies of the book at a signing after the program.